WHAT WE FILIPINOS SHOULD KNOW: Many baby boomers like me have earned several college units/hours of the Spanish language. However, due to our learned or conditioned bias against Spain and the Spaniards, we have not built on this language; which in retrospect surely carries so much history about us Filipinos, as a people and a nascent nation. Personally, I began to appreciate the importance of learning the Spanish language only after I decided, given my years of conscious prejudice against anything Spaniard/Spanish, to visit Mexico City in 2001. It was a pleasant surprise, encouraging me to learn more about Spain, the former colonial master of Mexico, most of Latin America and our homeland. Thus during the winter of 2003, I did a 2-week backpacking trip to Spain concentrating on its southern/Andalusian region, which for almost eight centuries was ruled by the Muslims. It was a real eye opener about the Spanish people and their history, their relevance to our Filipino world. And recently last September, I again went backpacking for more of Iberia, and this time traveled to Portugal and northern Spain. Accidentally, unbelievably and happily, I even stumbled into the hotel Dr. Jose Rizal stayed in Barcelona! I see myself returning for more of the Spaniards and Spain. Pardon me for indulging. My point is that we so-called educated Filipinos, past, present and future ones, have and are continually kept ignorant of so much of our national history by not knowing the language of Spain, which discovered and ruled our homeland for almost 400 years. I think and believe that we gravely deprieve ourselves of relevant historical and cultural knowledge; that not knowing much of our Spanish past --especially before our American colonization-- contribute greatly to our not knowing ourselves. In restrospect, of course, that our former American colonial master contributed to this biased conditioning is understandable; as all victors highlight their greatness or goodness that only give birth to their self-righteousness, while they simultaneously highlight only the evils of their defeated enemies. Believing there's a deliberate attempt to erase Spanish culture from our lives, Dr. Summers decided to analyze the historical sources of this prejudice, which is known as "La Leyenda Negra" ["Black Legend"]: "the depiction of Spain and the Spaniards as bloodthirsty and cruel, greedy and fanatical, in excess of reality." (Nationmaster.com Encyclopaedia) Of course, there is the opposite "Leyenda Rosa" that views Spain through rose-colored glasses. Both expressions are the results of thinking in terms of things being purely black or white, "and not propitious for a neutral historical analysis except of folkloric perceptions." In December last year, Summers presented a synopsis of his findings in a talk he gave at the Ateneo, which I unfortunately couldn't attend. He traces the prejudice back to the Propaganda Movement's "vicious, anti-friar propaganda, ca. 1880, and the second, the northern, Teutonic version imposed by the US invasion forces and occupation government after 1898." The Americans systematically encoded the black legend in governmental and educational agencies. In this manner, people in general were brainwashed into rejecting the idea that both were basically exploitative colonizers. Many feel that the US perpetrated the legend to justify their actions against Spain. Even up to the present, they say, evidence of the Black Legend exists in movies like Steven Spielberg's "Amistad." Even pirates of the Caribbean are presented as romantic figures (in the movie of the same title), when in reality they were incredibly cruel and no more than criminals. To this day, the legend lives on, "seriously distorting both the teaching of and research on the history of the Filipino people." The Spaniards, by the way, were their own worst enemies. The Black Legend started in 1552, when Bartolome de las Casas, formerly bishop of Chiapas, published "Brevissima Relacion de la Destruycion de las Yndias," which has been described as "a powerful and lasting indictment of Spanish behavior toward Indian populations in the New World." (How the good friar could have described it as brief is weird; the work is 4,000 pages long.) Naturally, the Protestants picked up Las Casas' condemnation with alacrity and used it to argue for a greater non-Spanish European presence in the New World and, of course, for their own imperialistic designs. I actually had a good grounding in Spanish, having gone to seminary and trained by Spanish priests. However, I tried forgetting the language, staying away from it, during the years when I toyed with misguided nationalism and "radicalism". But because of my exposure to the language at home (my father and grandfather both spoke Spanish), I think it was something that was hard for me to get rid of. But just to prove myself "nationalistic", I shied away from the language for almost 10 years, and didn't give it another look until I landed in Chicago in 1977, where I happened to live in a neighborhood with many Spanish speakers. Strange as it may seem, my "reawakening" took place in the "belly of the beast". And so it was that the language came back to me naturally, a little at a time. Then in 1979, after I had completed my training community development at the Ecumenical Institute of Chicago, a good friend of mine (a Maryknoll priest from Venezuela) asked me if I would be willing to do a "practicum" in Per* for a year, by initiating a development project in a hill community south of Lima, the capital. I jumped on the opportunity! My wife and I and our first-born worked in that village for almost a year, and from that time on - my images of the Spanish and the Spanish-speaking world got turned upside down. True, there were abuses during the Spanish regime in the Philippines as well as in the Americas, but at closer look - I really had no sensible reason for trying to hate the language or culture. Now, 26 years after my first sortie into Latin America, I have travelled far and wide in the Spanish-speaking world (but not in Spain!). In addition to Per*, I've travelled to Mexico, Argentina, Uruguay, and...Cuba (a country I've visited twice and have since learned to love). The Filipino's hatred for Spanish can only be attributed to mis-education by a U.S.-designed, US-influenced educational system. To put it simply, we've really been blinded by "American junk", not just linguistically, but politically, economically, and culturally. From where I sit, I've come to know and understand that, while Spanish may have been the language of Fray Damaso and Fray Salvi (fictional characters, anyway), and was the preferred language of the ilustrados - the language of Cervantes also happens to be the language of La Pasionaria, Camilo Torres, Ch* Guevara, Fidel Castro, and Gens. Juan Velasco of Per* and Liber Seregni of Urugu*y (military men with a social conscience). Spanish also happens to be the language of Liberation Theology, which many progressives in the Philippines espouse. The Black Legend has kept us in the dark for almost a century now, and it's time to undo it. There are many things to learn from Latin America. That continent, which shares many similarities with the Philippines - is on the cutting edge of political and social movements. Rather than reject that part of the world, we should make every effort to reach out. To be honest with you, there were many facts that were hidden from Filipinos by the Black Legend. While we love to point to Spain as the "oppressor", few Filipinos are even aware that, although we were a colony of Spain - Filipinos (kastila, creole, indio) were Spanish citizens under the Cadiz Constitution of 1812. If we insist on denigrating and demonizing Spain and Spanish, then we might as well reject the men of Solidaridad, who articulated their positions in Spanish. By looking at Spanish as something foreign - we turn Rizal into a foreigner. Perhaps the only way to understand him is to understand him in Spanish. As things are right now, we simply venerate Rizal, without really understanding him. We idolize the more proletarian Bonifacio, because he led our war of independence, without taking into account that he was heavily influenced by his reading of "Noli" and "Fili", and even translated "Mi Ultimo Adi*s" into beautiful tagalog. There was no way Bonifacio could have grasped Rizal without knowing Spanish. So, even "The Great Plebeian" was well-versed in the language of Cervantes. 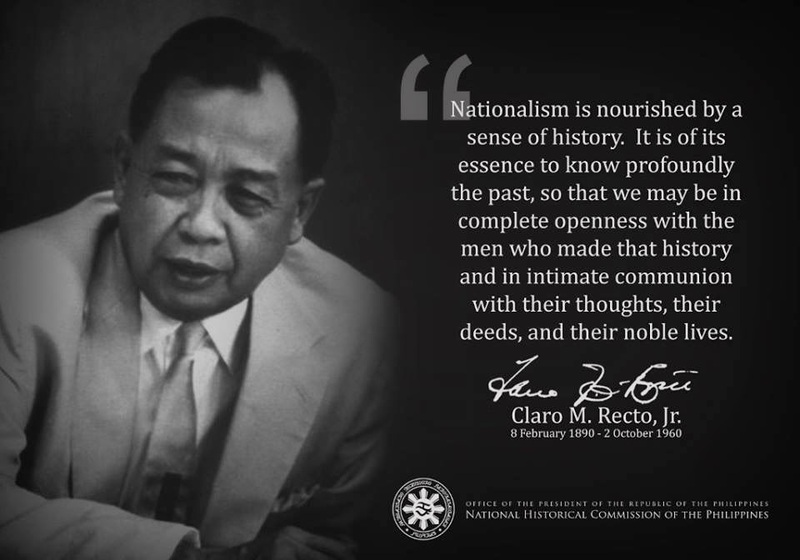 And lest we forget, the greatest anti-imperialist in contemporary Philippine history, Claro M. Recto - was himself a hispanista who authored the Spanish law making the teaching of the language mandatory in high school and college. Our generation considered that law elitist, tyrannical, and irrelevant, without even understanding why its prime mover sponsored it in the first place. And so, without trying to be overly sarcastic, I still have to ask the question, "Sino ngayon ang gago?"